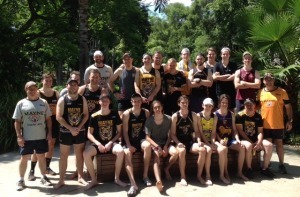 A tight knit group finished off the pre-Christmas training sessions and the 2017year at Southbank this morning with a modified triathlon and a sausage sizzle. The main sessions finished off on Thursday night but today was a special morning for those available to cap off the year with a bit of fun to head into the Christmas break. The Mayne Tigers wishes all of their members, family, friends and supporters the very best for the Christmas season and the New Year. Training will recommence on the 16th January 2018.